Buy Wow Green Coffee Bean Extract Capsules – 60 Count at Rs 299 only on Amazon. Order now before the price goes up. These are gluten-free capsules, totally free of binders, fillers and additives. Hurry!!! Limited period offer. 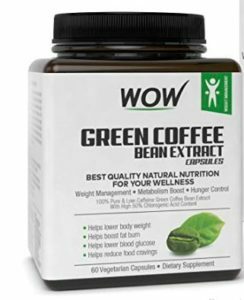 How to Buy Wow Green Coffee Bean Extract Capsules – 60 Count at Rs 299 only?